Being a guy and saying ‘I love you’, to another guy is considered taboo. Seriously though, there’s nothing wrong with loving your friends. And there’s also nothing wrong with telling them that you feel that way about them. The more we do it, the more we’ll be able to normalise such behaviour. That’s the aim, anyway. Saying ‘I love you’ to a close friend doesn’t suddenly mean that you necessarily find them physically attractive. Nor does it mean that you’ve suddenly changed your sexual orientation. Although (of course) it can if you want it to. We often stop ourselves from saying those three little words because we think that’s how others might react; they might think we fancy them. But you might be surprised, and your fears could be largely misplaced. Love isn’t just about physical attraction: it can mean so many different things and plenty of them are non-romantic. According to the Southbank Centre in London, which hosts the Festival of Love each year, there are seven types of love. Today, we’re only talking about one of them: platonic love between friends. This is defined in broad terms as a type of love which is non-sexual. Rather, it’s about showing someone that they are of personal importance to you and that they add value to your life. 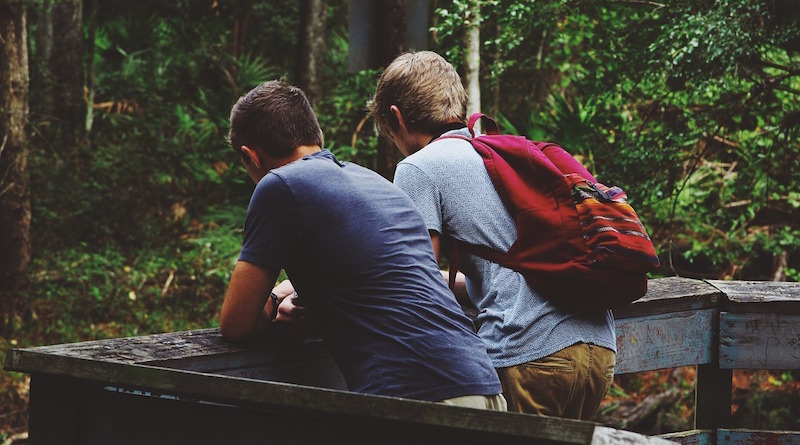 You might have heard of this term being described as a ‘bromance’ between two guys, or even a ‘womance’ between two women. Either way, beyond the social construction of these two concepts it’s a love based on the two pillars of understanding and respect. So, if there’s someone you can think of in your life who you love, and you’d like to tell them, give it a try. If you’re thinking about how that might turn out, then here’s a little YouTube video that has caught some guys doing just that, telling their male friends that they love them for the first time.